FOMAC proud to be supporting CRASH, the construction and property industry’s charity for homeless people. 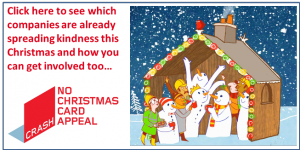 FOMAC are supporting CRASH’s No Christmas Card Appeal. CRASH is the construction and property industry’s charity for homeless people. With the UK bracing itself for a record cold winter, many of us take solace in the knowledge that Christmas will be spent in an environment of warmth, kindness, support and love. For the thousands of homeless in the UK, the festive period has different associations: Isolation. Rejection. Fear. Uncertainty. As such CRASH is again appealing to the industry to make a practical contribution as part of its No Christmas Card Appeal. As always, the premise for the appeal is very simple: CRASH is asking companies to donate their full Christmas card budget. The money raised will then enable CRASH, through its unique relationship with its patrons, to construct and renovate emergency night shelters, hostels, day centres, hospices and move-on accommodation, providing a safe and welcoming refuge for people in need, not just for Christmas, but throughout the coming year and beyond. CRASH is a practical charity addressing the issues of homelessness by harnessing the skills, products and goodwill of the construction and property industry to improve hostels, day centres, night shelters, training centres and move-on accommodation, for frontline homelessness agencies who work directly with homeless people. CRASH focuses on projects that help single homeless people aged 18 and above. CRASH has decided to focus on this specific group of people in need as they are not entitled to receive any statutory assistance from the local authority and are therefore extremely vulnerable. The result is that the buildings homeless people need can be refurbished and developed to a much higher standard than would otherwise be possible. CRASH help continue to build a better future for vulnerable homeless men and women. CRASH is a UK registered charity (no. 1054107) and operates throughout the UK. PLEDGED YOUR SUPPORT NOW #NOXMASCARD.